You can set up a platinum price alert by opening an account for free! The correlation between the platinum price and the gold price is a statistic some investors sometimes use to estimate how well platinum is doing compared to gold. Over a period of 32 years, there were a few moments in history when the platinum price per ounce was lower than the gold price. The lowest platina/gold ratio was reached in 1982. The highest point of gold was reached in the 70’s, mainly due to stagflation. This is an economic phenomenon in which the economy grows slowly due to high inflation, rising prices, high unemployment and a decline in Gross Domestic Product (GDP) accompanied with stagnant demand. The longest period that the platinum price was higher than gold price was in the period of June 1987 until September 2008 (21years). Over a period of 32 years, the platinum price per ounce was higher than the gold price 65% of the time. Nevertheless, since 2011 the gold price per ounce has exceeded the platinum price. Although the price of platinum is currently lower than gold, both prices move in the same direction. The historical development of the platinum to gold ratio (Source: Bespoke). 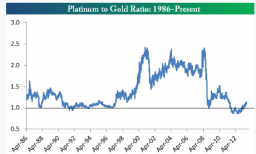 Above the historical development of the platinum/gold ratio. The platinum/gold ratio can be calculated by dividing the platinum price by the gold price. The platinum price ratio is sometimes used by investors to estimate whether platinum is an interesting investment. Currently the platinum price ratio is 0.73. Reversed, the gold/platinum ratio is 1.33 (July 2017). The gold and silver prices are retrieved from the COMEX-division of the stock market in New York while the platinum price is retrieved from the NYMEX-division. Pricing of the platinum price works the same for gold and silver. At 8.20 AM the stock market opens when the open outcry of buyers and sellers starts. Still, the electronic trade platform of the CME Group - of which the NYMEX is part of- is the most important indicator for the platinum price. How Is the Price of Platinum Set? In comparison to gold, the platinum price is dependent on the industrial demand and the mine production. The platinum price is strongly influenced by the mines in South-Africa. More than two thirds of the yearly platinum production is produced by South-Africa. About 80% of platinum reserves underground are located in South Africa. As a result, there was a lot of focus and media attention on mine workers when they were on strike in South Africa back in 2014. In addition, developments related to the production of platinum in Russia have a strong effect on the development of the platinum price. About 12% of the yearly platinum production is produced in Russia. The manufacturing of cars play an important role for platinum demand. More than 40% of platinum demand is held by car manufactures who use it to produce car catalysts. Platinum is not only used for products, it is also being used for the production of jewellery or even in medicine such as chemotherapy. Platinum in contrary to gold is very dependant of industrial demand and mine production. This is due to the fact that mine production is geographically concentrated. Therefore the platinum price behaves in a very volatile manner. The platinum price fluctuates the most among all precious metals. To give an example, the platinum price fell from its peak in 2008 from $2250 to $777 an ounce inside to six months. However, the previous rise to $ 2,250 an ounce can be explained by forced work breaks due to the poor electricity supply in South Africa. Due to the dependence on the mining industry in South Africa, the platinum rate is volatile and will remain volatile. However, the extent to which the platinum price can fall or rise is limited. There is a link between the palladium and platinum prices. When the platinum price rises sharply, it becomes more interesting for instance for car manufacturers to change to palladium and vice versa. Of course, this replacement effect does not occur when prices of both metals increase. Platinum recycling (which is already significant) also increases as platinum prices rise. Although platinum compared to other precious metals is very volatile, the platinum price volatility reached a low in 2014. For example, the platinum price fell less in 2013 than gold and silver. How well was the performance of the platinum rate (in euro’s and dollars)? With which percentage did the platinum rate increase or decrease on an annual basis? GoldRepublic uses the price of the current platinum price (the spot). The buy and sell price that are provided on the website includes the “dealer spread” in relation to the spot price. GoldRepublic offers very sharp platinum prices. No matter how much you buy, you pay per transaction the market price of platinum that usually only applies to professional platinum trade. Open an account (free of charge) and start investing in platinum!